Back sleepers are the ones that have the least trouble when it comes to finding the best pillow. Unlike side sleepers and stomach sleepers, the only requirement they need for the one that will be the most comfortable is that it should not be too high that their head is thrown forward. Therefore, what matters for back sleepers is the height and firmness of the pillow. Also, most of it depends on the sleeper himself, if he wants something that is soft or firm, as long as it’s not too high that it strains the neck. Most standard pillows are designed for back sleepers so you won’t have trouble looking for one. There are still things to consider though, when it comes to choosing the best pillow for back sleepers to make sure that what you’re getting is the one that will make your slumber deeper and more relaxing. More of these will be discussed in this article. What are the factors to consider when choosing the best pillow for back sleepers? Natural Fill – This fill is either feathers or down or a combination of the two. These feathers are sourced from ducks or geese from the coldest part of the world so that the feathers are naturally thick. Feathers and downs are very effective pillows because they trap air to mold it to the shape of your head. Synthetic Fill – Don’t be afraid to try synthetic pillows; they can be as soft as natural fill and not all are considered stiff and clunky. Synthetic fills are also cheaper and contain blends of the most technologically advanced man-made fibers. The result is a pillow that is soft yet provides enough support (depending on your choice). Memory Foam Fill – As the name imparts, this is made of foam fill that provide extreme support and is a little dense. Memory foam pillows aren’t as soft and fluffy as natural and synthetic. The foam is quite compact but it adheres to the shape of your head effectively. Thread Count – The higher the thread count of the pillow, the more plush and luxurious it feels. Of course, the price tag also increases. Standard sized pillows with about 300-thread count are already comfortable to sleep on. If you’re looking for more luxury and softness, go for about 500-800-thread count. It can go as high as 1000-thread count but these are extremely expensive. Fluffiness – Fluffy pillows are great for ventilating cool air onto your head. This is because the materials inside the pillow are still capable of trapping air inside. If your pillow is less fluffy, it means it can no longer trap air and becomes ineffective for giving comfort and support. Key Takeaway: What’s important for back sleepers is that the pillow shouldn’t be too high that it overextends their neck forward. This may cause strain and pain sensations when you wake up. The pillow fill, thread count, and fluffiness only add to the level of comfort and the choice depends on the sleeper. What are the recommended pillows for back sleepers? This pillow is great for different types of people because they have a choice whether to pick soft, medium, or firm density. It also comes in three sizes: standard, queen, and king. This pillow is very ideal for back sleepers because of the shape and contour of the pillow. It is just the right size so that your neck doesn’t sit in an awkward position. It has a single-chamber construction that holds 18 ounces of white down; 550 fill power. The down is housed in a luxurious 400-thread count 100% cotton in striped design. Pinzon pillows are guaranteed hypoallergenic, sanitized, and processed in USA. Both cover and pillow are machine washable. 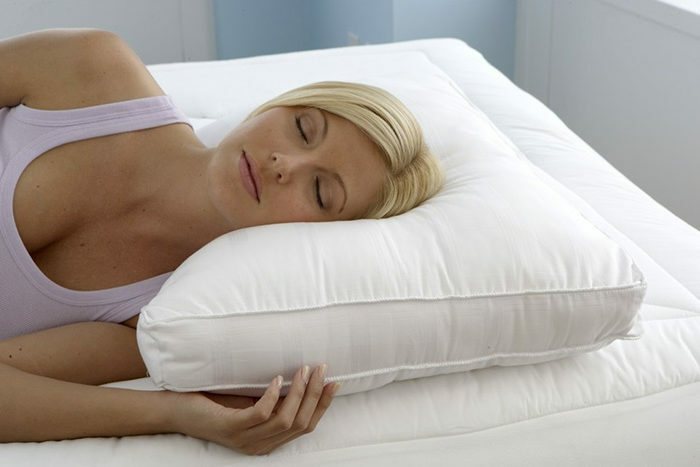 This memory foam pillow is ideal for a back sleeper who experiences neck and back pain. The contour of this pillow relieves neck, shoulder, and back pain by allowing the muscles to fully relax. It also promotes proper spinal alignment. You can choose from medium to medium-firm and sizes standard or queen. It is also recommended for side sleepers as it perfectly cradles the neck, keeping it aligned with the back. The pillow is made from SureTemp open cell memory foam that improves air circulation. It is also durable enough to mold to the shape of the head and shoulders without sinking down after continuous use. For this price, you’ll be able to get two standard-sized pillows filled with a good down alternative, which is polyester gel fiber that is equally soft and firm. This fill is good for back sleepers who move a lot during their sleep. This is because this down alternative delivers great loft recovery. It will not shift shape and lose support, meaning, you won’t wake frequently just to adjust and re-fluff your pillow. The fill comes in a shell made of 370-thread count 100% mercerized cotton with a floral jacquard pattern. The pillows are machine-washable and dryable. These are recommended for those who have allergic tendencies toward feather and down but still want to experience the softness and comfort they provide. Among all the types of sleepers, back sleepers are the ones who are the easiest to cope on different types of pillows, may it be natural, synthetic, or memory foam. As mentioned, as long as the pillow is not raised up too high, a back sleeper won’t have any feeling of tightness and pain when he/she wakes up. There is also no set requirement when it comes to softness and firmness; it all depends on the sleeper to find the best pillow.